Two English shoe salesmen were sent to Africa in the late 1800’s to see if there was a market for their product. Salesman two is the real entrepreneur, the person who sees opportunity where others do not. 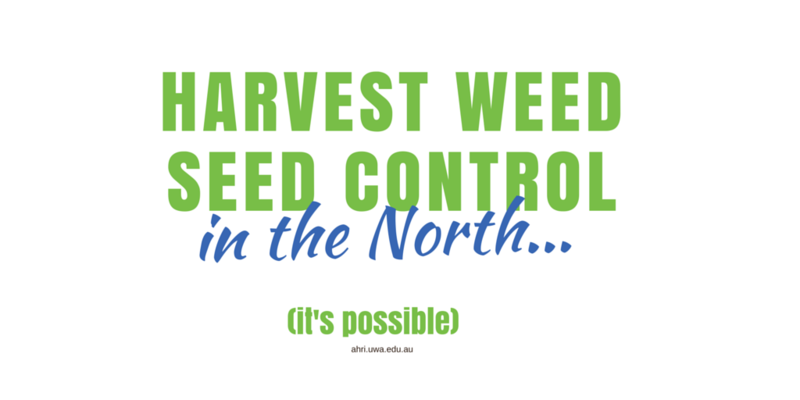 Very few grain growers in Queensland or northern NSW use harvest weed seed control. Many feel that most weed seeds shed before harvest so there is little point. Funnily enough, this is what the Americans said, and it turns out their main weeds retain all of their seed at harvest! 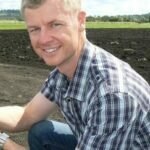 A survey of 70 paddocks in 2011 by Queensland Department of Agriculture and Fisheries (DAF) researchers Steve Walker, Michael Widderick and Michelle Keenan has identified a similar ‘glorious opportunity’. They found excellent seed retention at harvest of several key weed species in winter crops. Seed retention and height of weed seeds in summer crops was not as encouraging, but there are some isolated opportunities here as well. In 2011/2012, a survey of 70 winter and summer cropping paddocks was undertaken by DAF in northern NSW, southern and central Queensland to identify which weed species were present and setting seed in crop at harvest time. The table below is a summary of the seed retention of some of the key weed species. Table 1. Seed retention (%) at the beginning of harvest of eight weed species in the northern region. Which weeds are candidates for harvest weed seed control? Seed retention at harvest is one thing, but is it possible to capture those seeds and destroy them? Which weeds are in for harvest weed seed control and which are out? Definitely in – Turnip weed and African turnip weed are likely to be very good candidates for harvest weed seed control (HWSC), however, these species are not currently causing growers big resistance issues. Definitely in (winter crops) – Annual ryegrass and wild oats are good candidates for HWSC in winter crops. We know that wild oats shed their seed at about 2% per day compared to ryegrass at 1% per day (see this past AHRI insight), but there is still a good opportunity for HWSC at the start of harvest. Possibly in (winter crops) – Summer weeds Barnyard grass and Feathertop Rhodes grass are probably the unlikely candidates here. They are known to shed their seed in summer crop but perhaps where they germinate in spring in winter crops they may be good candidates for HWSC. Possibly in (summer crops) – Feathertop Rhodes grass shows some promise for HWSC in summer crop with 79% seed retention at the start of harvest in this survey. This number is likely to fluctuate so it may be an opportunistic target. Out – Sowthistle seed retention was low and this weed tends to disperse its seed the same day as the seed head opens. Fleabane appears to retain its seed at harvest but may not be a great candidate due to the wind-borne nature of the seed. It’s evident from this survey that weeds in winter crops retain more of their seed at harvest than weeds in the summer crop Sorghum. There are a couple of reasons for this. Firstly, the growing conditions in summer allow for weeds such as Barnyard grass and Feathertop Rhodes grass to germinate with the crop so by the time harvest comes around they have matured, set seed and these seeds then have the opportunity to shed. Also, Sorghum is planted on wide rows (e.g 1m) giving the weeds opportunity to grow with low levels of competition. This may reduce the height of the weeds at harvest. Weeds such as Barnyard grass and Feathertop Rhodes grass need warm soil to germinate. These weeds can germinate in spring in winter crops and, as a result, may retain their seed at winter crop harvest. 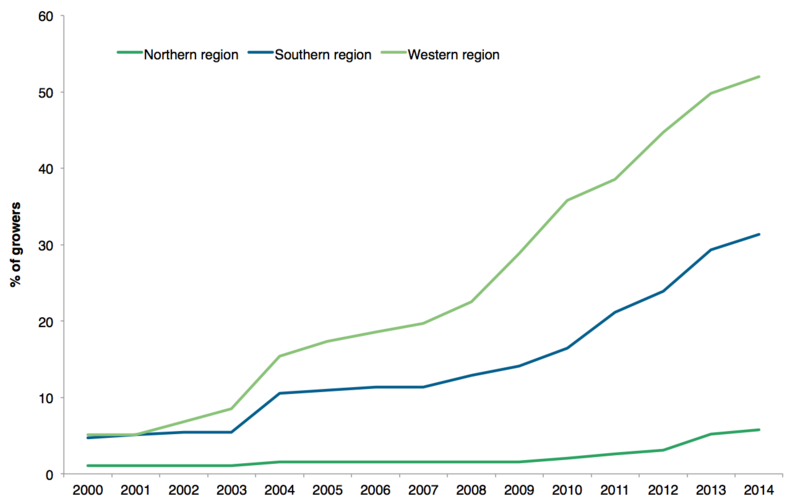 Adoption of HWSC is very low in the northern region compared to the west and the south. This could be because herbicide resistance levels have been typically lower in the north, until now. Or it could be because the weeds in the north don’t suit harvest weed seed control. The chart below is from a recent national weeds survey conducted by Rick Llewellyn, CSIRO funded by GRDC. Winter crops are the obvious starting point as seed retention is highest here. The national weeds survey found that 15% of northern region farmers are already diverting the weed bearing chaff fraction onto permanent wheel tracks in controlled traffic farming (CTF) systems. This is a great option for growers already on CTF and can be achieved at low cost. Narrow windrow burning in chickpea crops is the other easy place to make a start at HWSC. Seed retention was excellent in chickpea crops in this survey and it is simple to burn chickpea windrows without burning the entire paddock. Burning windrows in cereals is possible but more complex given the higher yields and dry matter production in this region. Weed control is easy when all of the herbicides work. When the herbicides stop working we need to use an integrated approach that includes herbicide and non-herbicide tools. Is there a ‘glorious opportunity’ to use harvest weed seed control in the north? This survey would suggest so and we need some farmers, who see an opportunity where others do not, to give it a go.